Summertime is an important season for growth - not only in nature for the fall harvest but for people, too (especially youth)! So much growth physically takes place sometimes in our youth that, come fall, teachers do not even recognize their returning students! But there's more to growth than the physical dimension. What about social and spiritual growth, too? That's where our summertime youth programs come in. 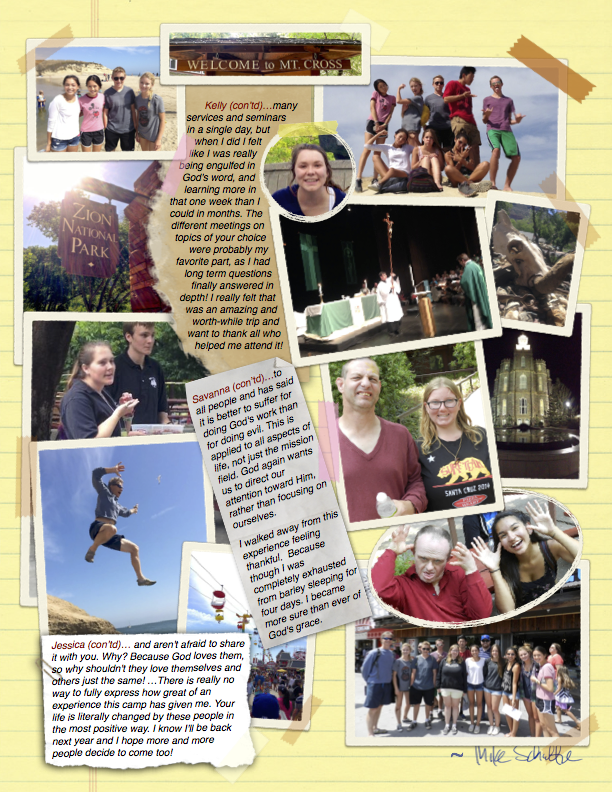 This year, we are excited to return to Special Friends Camp in Santa Cruz July 29th thru August 5th, 2017. Nobody returns from that summer camp experience the same person. Click here. 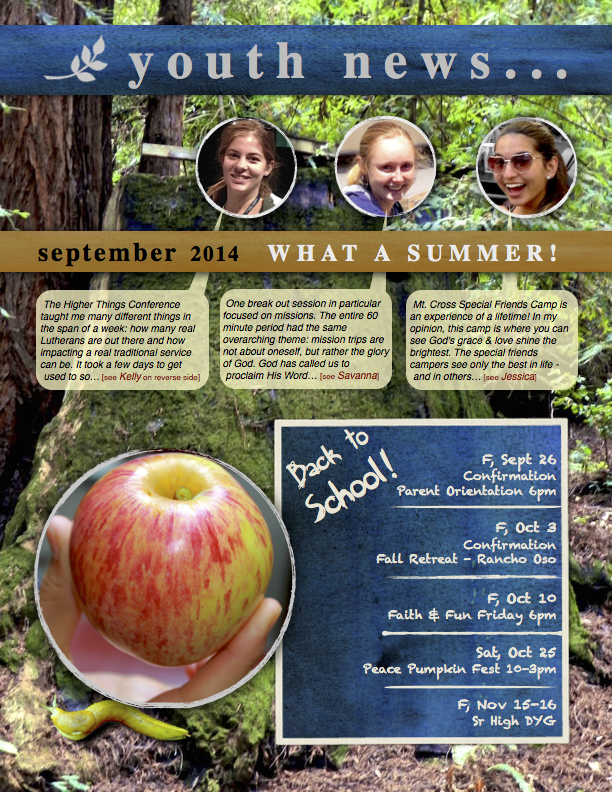 Click on the youth newsletter pages (to the right) to read firsthand accounts of our exciting summer (for downloads: PDF pg 1, PDF pg 2). Vacation Bible School, summer missions and spiritual growth trips were just a few of the ways we experienced spiritual growth together. 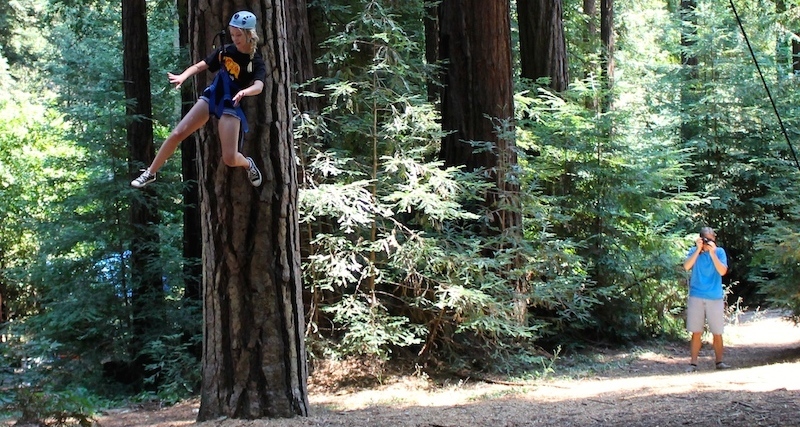 Kayla does her best impersonation of Peter Pan on the high ropes course. FAITH UNDER FIRE Bible Study - Wednesdays 6-8pm (pizza & video discussion). We gather weekly to be challenged with probing questions about life, school, friends, direction and meaning. We meet at Christ the King Lutheran Church in Newbury Park. Here's a recent question we discussed: "If you could ask God one question, what would it be?" Join in on the discussion, and let us know what you think! A.S.K. - 9:30am on Sundays (Coffeehouse). Here's your chance to frame the questions. High school students' questions are heard and answered. What would you like to know about the Bible, God, the Christian faith and other spiritual things? Just ask. There are lots of ways for sr. high youth to get involved at Peace. For example, it is good (after those jr. high years acolyting) to continue serving in the worship services by becoming a rotating reader or greeter Sunday mornings. You may wish to help out as an usher or musician/singer in choir & praise band. Community service opportunities also include Reading Mentoring, Many Meals, VBS, fundraising, etc. You're invited to join us on big trips like the NYG & Winterblast. Let Deacon Mike know!